As a Content Creator, I use my platform to positively influence and uplift others by sharing bits and pieces of my daily life through social media and blogging. To some, my stats don’t make me an Influencer. The feedback and questions I get from my supporters say otherwise. When you really get down to it, numbers aside, those of us Content Creators who don’t have “a lot” of followers are still Influencers. No matter the size of our following, we can still influence our audience. 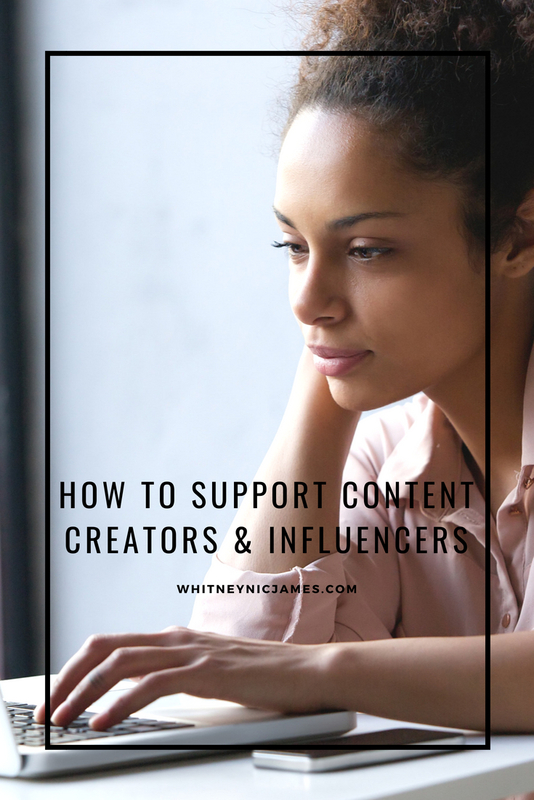 If you want to know how to support some of your favorite Content Creators and Influencers, check out a few easy ways to do so below! Content Creators who don’t have “a lot” of followers can still influence their audience. Sounds obvious, right? You’d be surprised at how many people want to support their favorite Content Creators and Influencers, yet they don’t even follow them on social media. So, first thing’s first. Choose a social media platform (or 2) and press the follow button. Once you’ve become a follower, engage. Comment on their posts, tap the heart to show some love or share their posts with your followers. Let your favorites know you’re there! Planning, promoting and hosting events takes a lot of time, money and energy. So, showing up at an event hosted by your favorite Influencer is another way to show your support! If you can’t attend, sharing the event information with your followers can make a huge difference. Same goes for Content Creators. Sharing their content, that’s relevant to your audience, is one of the easiest ways to show your support. Purchasing a product or service is yet another great way to show support to your favorite Content Creator or Influencer. If they offer something that is of value to you, make the investment. I also suggest taking it a step further to publish an honest and thoughtful review. Trust me, it’ll be appreciated and it may encourage others to purchase the same product or service as well. Tell me, how do you support some of your favorite Content Creators and Influencers? Comment below! Thanks, as always, for reading and commenting and until next time, be blessed and stay safe. Despite the janky algorithm, Instagram is still my favorite social media site. Many of my fellow creatives and entrepreneurs have complained about the lack of engagement on their posts, as well as the random drop in their following. Trust me, I see it and I’ve been affected. My following seems to be at a standstill, and my feed seems to be stuck on only sharing the same 6-7 posts, from the same people. I get it, trust me I do. However, I still enjoy scrolling and double tapping through my favorite feeds, and I’m quickly becoming a huge fan of Instastories. I believe the Instastories feature has revived Instagram. While the new feature has allowed me to engage with my audience more, there are a few things I’ve noticed that have helped increase my visibility. 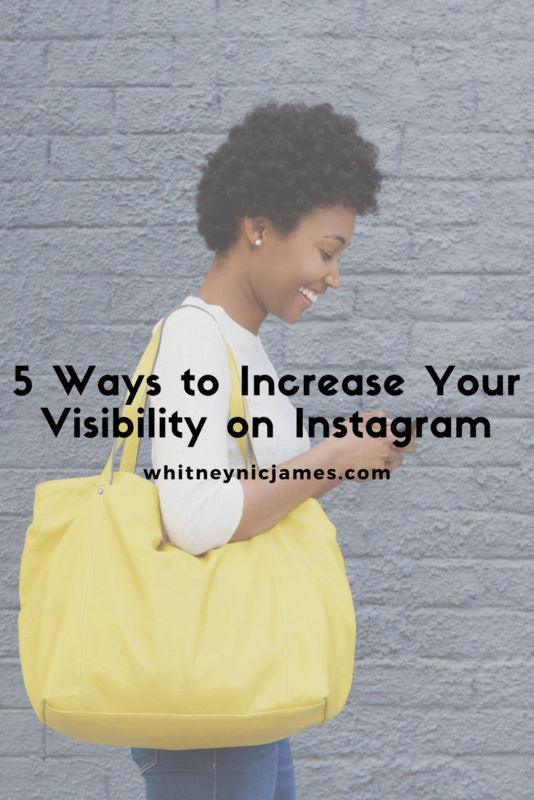 Continue reading to find out 5 ways you can increase your visibility on Instagram (at the moment). I would say in 2018, but we all know there’s a strong possibility things may change. But for now, the tips below will definitely help. As far as the aesthetics of your Instagram feed, I’m a big fan of theme based feeds. I find these accounts more visually appealing. As a content creator who has their own Instagram theme, I will say this makes coming up with content less stressful. Not only do you have an idea of what to post next, but you’re audience also knows what to look forward to. I call my Instagram theme IPL: Inspiration (quote or scripture), Personal Style (outfit post), and Lifestyle (food, family, products, etc.). So tell me, what do you think about Instagram? Do you find any of these tips helpful? Let me know! I plan to share more social media content in 2018, so feel free to let me know what you’d like to read about! As always, thanks for reading and commenting and until next time, be blessed and stay safe. Of all the social media platforms, Instagram and Snapchat are my absolute favorites! As I’ve said many times before I’m a very visual person, so it makes sense that these are two of my favorite apps. To be honest, I was late to the Snapchat party. It wasn’t until my 13-year-old sister gave me an intense lesson that I began to consider joining. Once I read Gorgeous in Grey’s comprehensive how-to use Snapchat guide for adults, I was sold. I downloaded the app and haven’t looked back since! So of course, I’m going to do my best to convince you to hop on the bandwagon. 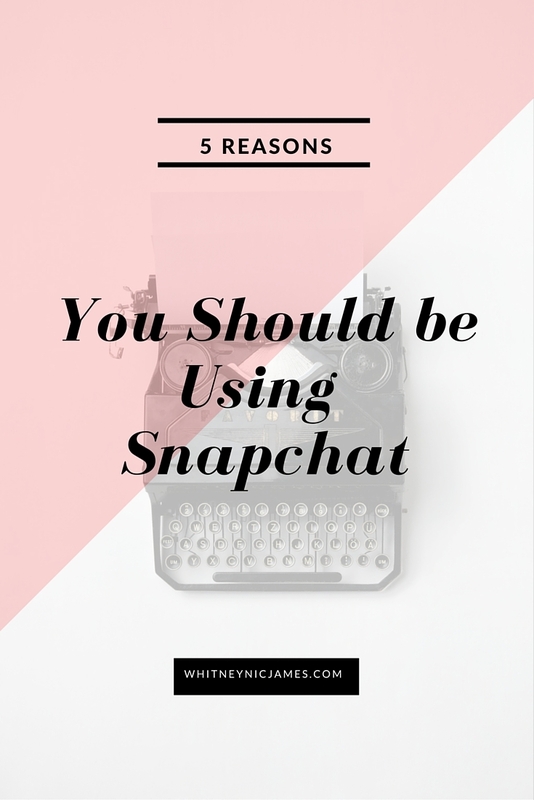 Here are 5 Reasons You Should Use Snapchat! 1. Show the Real You | I love this app because it’s a great way to show people “the real you.” Sharing snippets of your day allows an instant behind the scenes look at what your days are really like. We live in an world where seeing how others live their lives is interesting to us. We also enjoy sharing (some of those) moments with others. Well, at least that interests, sort of. For that reason Snapchat is a must! 2. Inspire & Uplift | Snapchat is another platform where you can inspire and uplift others through your verbal messages, snaps (pictures) and quotes. Yes, you can type messages on the pictures you upload. It’s a great way to share positive messages, rants, or even songs with your followers. As with any platform, I believe you should be careful what messages you’re sending out into the social media universe. What you share says a lot about what you stand for and what you believe in. 3. Promote Yourself | Have something to sell? An event you want people to attend? A product you want us to try? 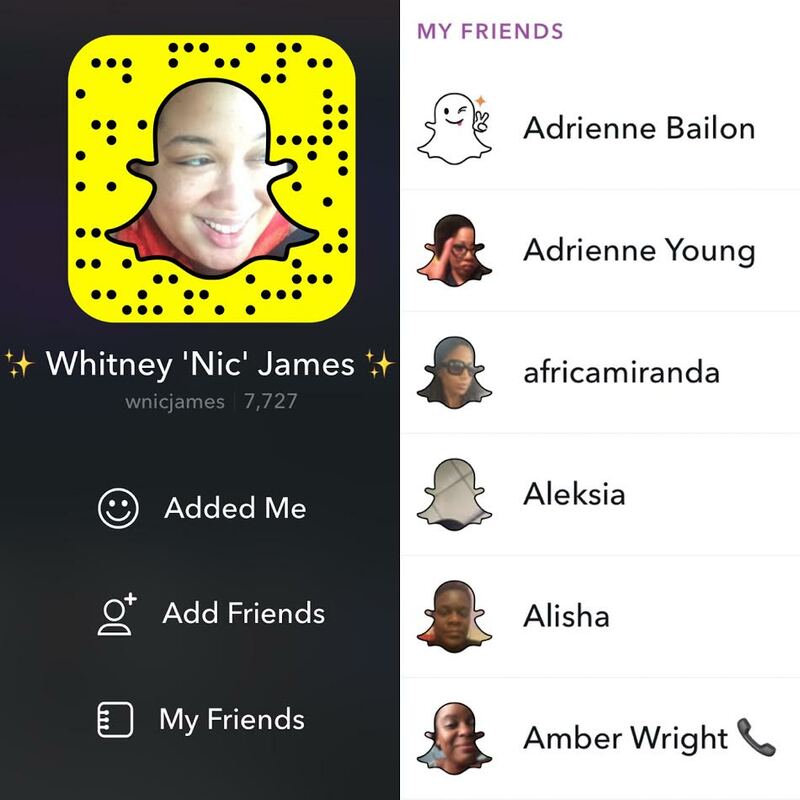 Snapchat is a great way to share and promote that! Many companies don’t use Snapchat the correct way, in my opinion, but I think it’s a genius way to promote and market your brand/or product. You have a captive audience, so what better way to promote your blog, product, event or services using yet another social media outlet? 4. Get Instant Feedback | I love being able to interact with friends, readers and others. Snapchat makes it so easy to do so! You can comment/reply to a persons snap, as long as they have that option available. Most Snapchat users, at least the ones I follow, do have this feature available. It’s a great way to get instant feedback about an idea, product or question you may have. Don’t have any feedback to give? You can simply start a conversation or let the person know you like whatever they’ve shared! 5. Follow Your Favorite Celebs & Brands | Since I was young I’ve had an interest in knowing the in’s and out’s of certain celebrities. Questions like what do they eat for dinner or what products do they use everyday always seemed to run through my mind. As far as brands, I’ve always been fascinated with the behind the scenes process of how things are created, made, etc. The celebrities and brands I choose to follow answer those questions, and much more! Just another reason why you should use Snapchat, just saying. So tell me, are you on Snapchat? If so, what are your thoughts about this social media outlet? Let me know! Thanks for reading and be sure to follow me on Snapchat (here), if you’d like. Until next time, be blessed and stay safe…XO! In case you didn’t know, I’m a very visual person. When it comes to how I learn and how I go about growing my business(es), how something looks is very important. In a nutshell, beautiful images, clean and simple design, as well as appealing imagery makes me happy. Because of this, I’m very particular in choosing who to follow on Instagram. If your feed has pretty pictures, inspiring quotes, well designed flat lays and cute kids, I’m all in! 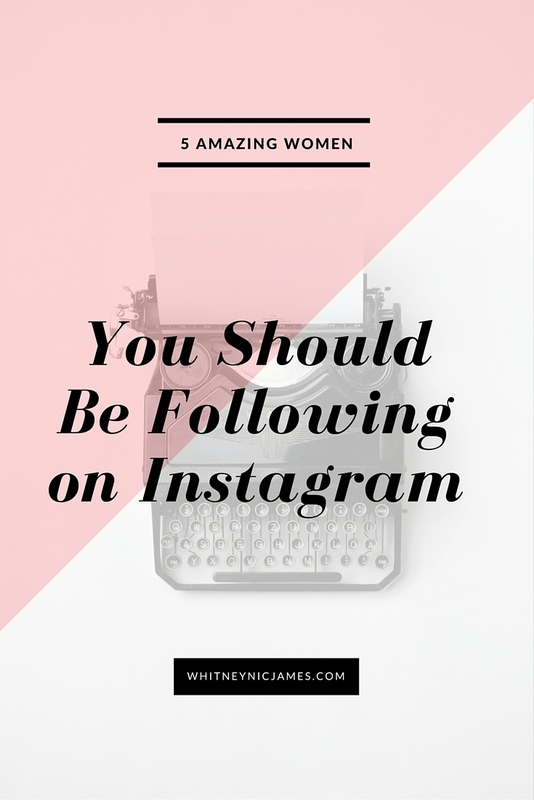 Below are 5 (more) amazing women that I follow on Instagram. 1. @WhitneyNicJames | I had to include my account, of course. I’ve actually had quite a few fellow bloggers and followers comment on the style of my feed and content. I’m extremely thankful for the positive feedback. I’ve worked hard to create a certain aesthetic and I continue to challenge myself to post inspiring, stylish and uplifting content regularly. 2. @DaynaBolden | Dayna’s warm spirit and down to earth personality can literally be felt through her images and captions. Dayna executes her mission to inspire women to do all things with Love, Passion & STYLE flawlessly. Her Instagram feed is full of aesthetically pleasing style, lifestyle and product photos, along with the occasional posts of her adorable and ever so stylish baby girl. 3. @Brosiaa | This Arizona based Youtuber and Content Creator has been on my radar for years. I was first inspired to follow because of her minimalist lifestyle but as time went on I started to enjoy her candid, yet visually pleasing, lifestyle Instagram posts as well. Her tips on style, beauty and even fitness are always honest and presented in such a retable way. 4. @Styleandpoise | I’ve been following style blogger, Roni, for years. I’m such a fan of her colorful and chic style, but more importantly, she’s so positive and inspiring. Anyone who can inspire me AND look fly while doing it, you’re winning in my book. I also like the fact that Roni’s messaging is the same across all platforms. Trust me, that’s hard to find these days. Take a look for yourself; I’m sure you’ll love her just as much as I do! 5. @IamDionneDean | Dionne captures you right away with her exciting and lively Instagram feed! I thoroughly enjoyed scrolling and double tapping through her fashion-forward images, and I’m constantly inspired by her smart shopping tips and tricks. So tell me, are you following any of these accounts? Any amazing women on Instagram you think I should check out? Let me know! Thanks for stopping by today. I plan to share more #WNJSocial posts this year. My love for social media and blogging has grown over the years and I’m excited to share my thoughts, tips and what I’ve learned along the way. Until next time, be blessed and stay safe…XO! For the past 8 weeks, I’ve been steadily building my new Instagram account. I’ve been able to grow my following from 0 to 850 (+) in this short amount of time. When I had my old Instagram I had a decent following, yes, but I mostly posted without intention. I aimlessly shared images that I liked and hoped people would find them interesting. Not the best tactic. As a visual person, I’m constantly inspired by images, which is why I now focus so much on imagery. I do my best to share clear pictures, provide quick and valuable content, as well as a few real-life moments here and there. All in all, I share images with intention and images that are aligned with my purpose. I share what I want to see. I’m also more aware of who I follow and who I allow to follow me. I’m very protective of my brand and I’m picky about what I allow my mind to be consumed with when it comes to social media. 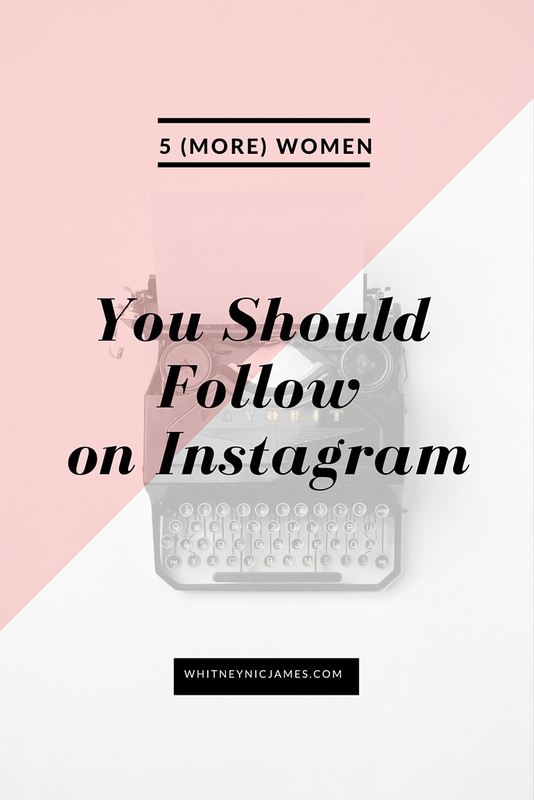 Below are 5 amazing women I enjoy following on Instagram. Check them out! 1. @FearlessWoman_Iam | By now I’m sure you’ve heard about the #FearlessWomanIAM movement, created to highlight and inspire fearless, stylish and entrepreneurial women of today. I decided to create an Instagram account in hopes to continue uplifting women by sharing images of other powerful women, insightful quotes, and thought-provoking questions. The feed is interactive, positive, and geared towards the fearless women. 2. @KylaLive | The creator of Pink Proverb, an inspirational and lifestyle blog, has a very inviting feed. From real-life happenings to heartfelt reminders/quotes and a sprinkle of personal style, Kyla shares a plethora of enjoyable images. This is definitely an account to follow if you fancy that mix. 3. @Alex_Elle | I love a good word or quote and Alex provides just that through her intentional and minimal Instagram feed. Her transparency is refreshing, and her intention to inspire is always evident. 4. @FourOneOhBlog | I fell in love with this account after meeting Tia, the blogger behind Four One Oh!, this summer. Her images tell a story and you can tell that she’s very intentional with what she shares. From fashion, to food and events, Tia’s feed comes to life! Seeing some of her pictures make you wish you were there. 5. @SwitchPivotorQuit | Filled with encouraging business & lifestyle content, this Instagram feed is designed to support and encourage women. According to the SPQ website, the creator, Ahyiana Angel, creating an environment where others find encouragement as a result of her positive energy, skill, and fearless attitude is one of her proudest moments. So tell me, who are some of your favorites to follow? Let me know! Until tomorrow, be blessed and stay safe…XO! Periscope has become my new thing. I mean it’s great! I love watching scopes every now and then, especially when the topics are about blogging, social media, entrepreneurship and lifestyle. I’m not addicted to periscope, or at least I don’t think I am, but I do watch certain “scopers” on what seems to be a daily basis. As I prepare to head to Blogalicious this weekend, I’m really excited because I’ll get to meet a few of my favorite periscopers/bloggers, as well as sit in their master classes and workshops. That said, here’s Part I of my 5 women to follow on Periscope list. Enjoy! 1. Whitney Nic James (@whitneynicjames) – Of course I had to make the list, lol. I’m not on as much as I’d like to be, but when I am I talk about inspiration, style, marriage and everything in between. It’s really a hodgepodge of topics and a continuation of what I post here on WNJ, as well as on my other social media channels. I plan to do more scoping this fall so be sure to follow! 2. 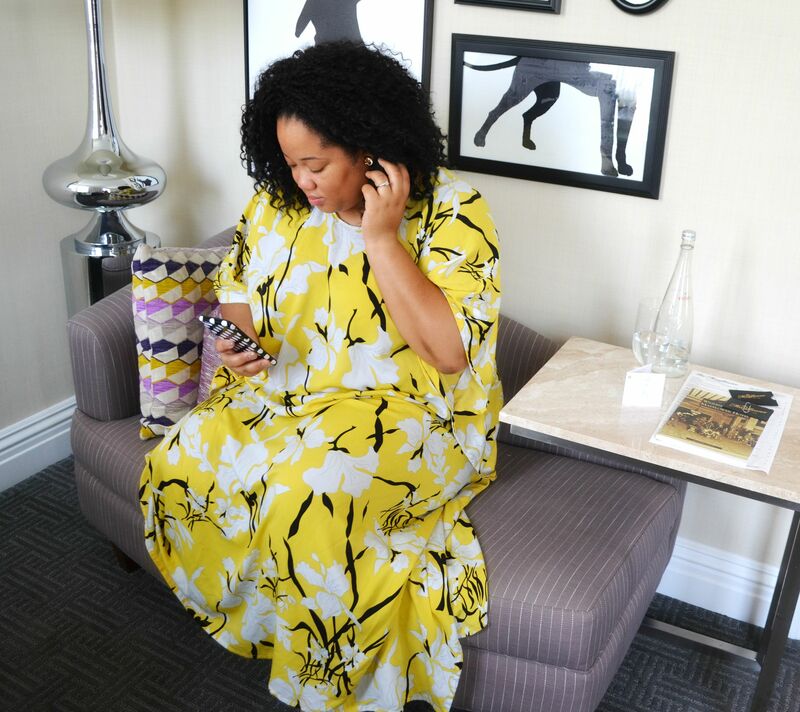 Rochelle Washington (@rosereddpaper) – Rochelle is my kindred spirit/soul sister. Her scopes on branding, creativity and life happenings are such great pick me up’s. Her delivery is honest and real; some would say a bit “in your face”. I’m the kind of girl who can appreciate that delivery, so I love it! Be prepared to be in your feelings, but ready to receive what she’s saying. Rochelle will be honest with you and will challenge you to be and do better, which is so necessary. Her messages come from an honest, since place – always. 4. Maya Elious (@MayaElious) – This Atlanta based design and brand strategist is the truth when it comes to branding and making money online. I respect her hustle and admire her work ethic; it’s incredible! Like her sister Mattie, Maya is always willing to share what she knows with her followers. She’s open and transparent about her business struggles and doesn’t mind sharing the in’s and out’s of what it’s really like to be a young entrepreneur. Be sure to follow her on Periscope and while you’re at it, check out her latest income report. If this doesn’t motivate you to go after your passion, not sure what will! 5. Leslie Hendricks Young (@FASHIONdujour) – Leslie is yet another one of my favorite people. I’ve had the pleasure of featuring her on the blog and whenever we get a chance to chat, I walk away feeling great. So of course, I follow this beauty on periscope! She scopes about life and relationships (marriage) and comes from a spiritual angle. I respect her realness and desire to share her Christian beliefs and morals with her followers. In the world we live in, Leslie’s approach and messages are refreshing and indeed necessary. 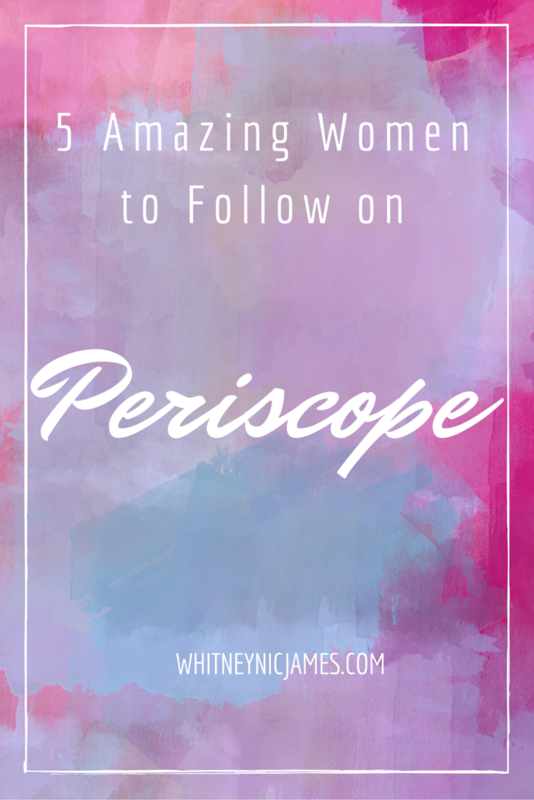 So tell me, what do you think of my 5 women to follow on Periscope list? Do you follow any of the ladies I mentioned above? Let me know! I hope you take some time to check out these amazing women. Part II of my list will be published soon. In the meantime, check out these leading ladies and be inspired! As always, thanks for reading and follow all with me on social media as I enjoy the Blogalicious conference this weekend! Be blessed and stay safe…XO! Lately, I’ve been really paying attention to who I follow on social media. I’ve come to the conclusion that it doesn’t make sense to follow everyone on every platform. There are very few people I choose to follow on multiple outlets. Nothing personal, it’s just my preference. It’s simple; I like to follow people who are positive, encouraging (without being preachy or redundant) stylish and helpful. If you can give me that on all platforms, great! If not, I’ll pick the platform that inspires me most and follow there. That being said, here are 3 reasons you don’t need to follow everyone everywhere. 1. It can be overwhelming. Have you ever followed someone who posts the same images and posts, 24-7, on every outlet?? The redundancy is a lot and while some people prefer that posting tactic, I’m not a fan. I like pictures and quotes, but not the same ones on every social media outlet. Pay attention to the posting patterns of those you follow and decide which outlet you can “deal with”. 2. It can become a distraction. Following someone everywhere can be a bit distracting. Recently I started noticing that I was missing out on some pretty good posts/announcements on Twitter. After sifting through my news feed, I saw there was a lot of “fluff” on my feed. That was causing a distraction and at the end of the day, I was missing out on some pretty helpful content. 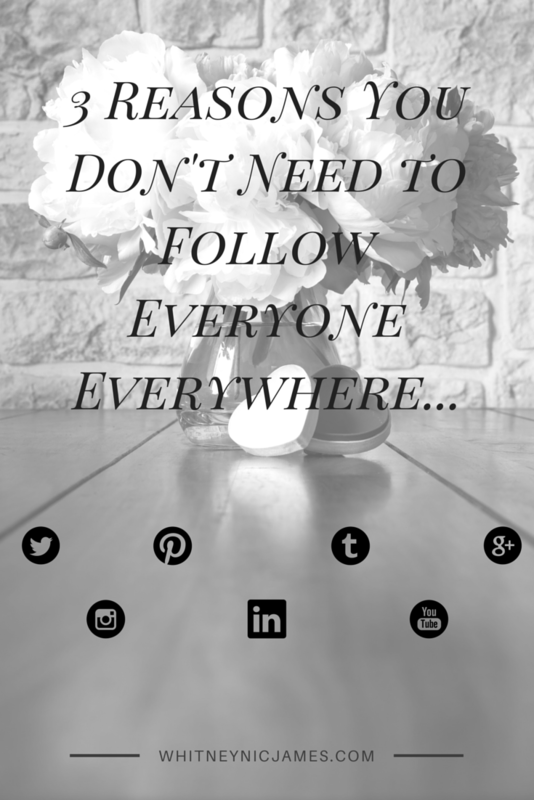 Check your feed and be sure you’re not being distracting and missing out on valuable content. 3. Every social media outlet has a purpose. I like Instagram for visuals, Twitter for conversation/engaging, Facebook for a little bit of everything, Pinterest for a recipe, home decor, and #OOTD ideas/pics, and Periscope for live interaction. Those who use each outlet “the right way”, I appreciate. Decide what you like to see from those you follow and pick your favorite way to follow. So tell me, do you follow everyone everywhere on social media? If so, why or why not? Let me know! Thanks for stopping by and as always, feel free to keep up with me this weekend on social media. You don’t have to follow everywhere though, LOL! Pick your fave outlet and I’ll be there. Have a wonderful weekend and until Monday, be blessed and stay safe…XO!